St. Alphonsus was born of noble parents near Naples, Italy, in 1696, and died in 1787. In the midst of many evils he appeared with a three-fold mission as Doctor, Bishop, and founder of a new religious Order. As Doctor he became the great teacher of Moral Theology; he found the middle way between the two extremes of the lax and the over rigorous, and by his ascetic writings he spread amongst the people Catholic piety, devotion to Our Lady, to Jesus in the Blessed Sacrament, to the Passion, and defended the supreme rights of the Church and of the Pope. As apostle and bishop St. Alphonsus sought to imitate Our Divine Redeemer in His evangelizing journeys through the villages of Galilee and Judea. Hence he founded his own society of missionaries whom he destined to labor among the poor peasants and mountaineers rather than the inhabitants of the towns. As founder of a new Order, the saint has the merit of having adapted the scope of his work to the needs of the time, and of having brought it to completion in spite of innumerable difficulties. Although approved by the Pope, the King of Naples refused to permit the new Order to establish itself. St. Alphonsus himself was excluded from the houses of his own Order in the Kingdom of Naples. This schism existed until his death. After his death the whole scene changes; the rejected founder is raised to the altars, and his Congregation extends its boundaries beyond the confines of Italy and of Europe. He was devoted in a special manner to the Holy Eucharist, and left a beautiful little book entitled Visits to the Blessed Sacrament. 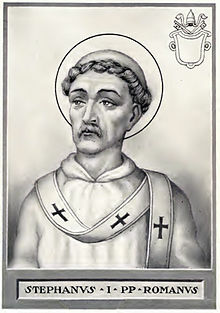 There is also a commemoration of Pope Saint Stephen I, Martyr who by birth was a Roman. He was made Pope on May 3, 253, and governed the Church for three years. He decided the question of the validity of Baptism when administered by heretics, ordering that the tradition should be preserved according to which it was sufficient that they receive confirmation. He was murdered by the Emperor’s soldiers while seated in his episcopal chair in the catacombs, during the celebration of Mass, August 2, 257. God, Who through blessed Alphonsus Mary, Thy confessor and bishop, fired with zeal for souls, didst cause Thy Church to bring forth a new progeny, we beseech Thee that, being taught by his wholesome precepts, and strengthened by his example, we may be enabled happily to come unto Thee. Through our Lord Jesus Christ, Thy Son, Who liveth and reigneth with Thee in the unity of the Holy Ghost, God, Forever and ever. Let us pray. O Eternal Shepherd, do Thou look favorably upon Thy flock,which we beseech Thee to guard and keep for evermore through the Blessed Stephen Thy Martyr and Supreme Pontiff, whom Thou didst choose to be the chief shepherd of the whole Church. Through our Lord Jesus Christ, Thy Son, Who liveth and reigneth with Thee in the unity of the Holy Ghost, one God Forever and ever. Lesson from the Epistle of blessed Paul the Apostle to Timothy. Dearly beloved, be strong in the grace which is in Christ Jesus, and the things which thou hast heard of me before many witnesses, the same commend to faithful men, who shall be fit to teach others also. Labor as a good soldier of Christ Jesus. No man being a soldier to God, entangleth himself with worldly business: that he may please Him to Whom he hath engaged himself. For he also that striveth for the mastery, is not crowned, except he strive lawfully. The husbandman that laboreth, must first partake of the fruits. Under stand what I say: for the Lord will give thee understanding in all things. I remembered, O Lord, Thy judgments of old, and I was comforted; a fainting hath taken hold of me because of the wicked that forsake Thy law. V. (Ps. 39: 11) I have not hid Thy justice within my heart. I have declared Thy truth and Thy salvation. Alleluia, alleluia. V. (Eccl. 49: 3, 4) He was directed by God unto the repentance of the nation, and he took away the abominations of wickedness: and he directed his heart toward the Lord; and in the days of sinners he strengthened godliness. Alleluia. Honor the Lord with thy substance, and give Him of the first of all thy fruits. Do not withhold him from doing good who is able: if thou art able, do good thyself also. O Lord Jesus Christ, burn our hearts thoroughly with the heavenly fire of this sacrifice for an odor of sweetness, Thou Who didst grant to blessed Alphonsus Mary both to celebrate these mysteries and, through them, to offer himself to Thee a holy victim. Who livest and reignest, with God the Father, in the unity of the Holy Ghost, God, Forever and ever. Let us pray. In Thy loving kindness, we beseech Thee, Lord, be moved by the offering of our gifts and enlighten Thy Church: that Thy flock may prosper everywhere and the shepherds, under Thy guidance, may be rendered acceptable to Thee. Through our Lord Jesus Christ, Thy Son, Who liveth and reigneth with Thee in the unity of the Holy Ghost, one God Forever and ever. A great priest, who ín his life propped up the house, and in his days fortified the temple as a bright fire, and frankincense burning in the fire. God, Who didst cause blessed Alphonsus Mary, Thy confessor and bishop, faithfully to dispense and preach this divine mystery, grant, by his merits and prayers, that Thy faithful may both frequently receive it, and, receiving it, praise it forever. Through our Lord Jesus Christ, Thy Son, Who liveth and reigneth with Thee in the unity of the Holy Ghost, God, For ever and ever. Let us pray. Since Thy Church has been nourished by the sacred repast, govern her in Thy clemency, we beseech Thee, O Lord, so that under the guidance of Thy mighty rule she may enjoy greater freedom and abiding integrity of religion. Through our Lord Jesus Christ, Thy Son, Who liveth and reigneth with Thee in the unity of the Holy Ghost, one God Forever and ever.